In the summer at the march� in St. Tropez, we buy a luscious, sweet tomato tart that we have come close to duplicating in this recipe. It uses Roma tomatoes that are first roasted in a very slow oven, then covered with a raw pastry dough and cooked at a higher temperature until the dough is a golden brown. Sugar is added to the tomatoes to enhance their sweetness so this tart can be made year round, even when Romas are not at their peak. This tart is simple to make, but allow enough time to roast the tomatoes slowly until they are meltingly tender. Keep the skin on the tomatoes so they stay intact during the long roasting. Preheat the oven to 190 -200� F.
Wash 9 standard size Roma tomatoes. With the point of a sharp knife, carve out the stem end. Then cut each tomato in half. With a knife or spoon gently remove the seeds on either side of the core, leaving the core in place. There is no need to remove all the seeds. Bake in the oven for about 2 hours until the tomatoes begin to look translucent. Remove from the oven and let the tomatoes cool on the baking sheet. While the tomatoes are baking, prepare the garnish and pastry dough. Process about 1 oz of blanched almonds into medium powder. Chop about 1/2 cup of plumped golden raisins. Blanch about 36 - 40 large basil leaves in hot water for about 30 seconds. (This removes the harshness.) Then chop the leaves. Mix all of these ingredients together and set aside. I use Julia Child's recipe for a demi-feuillet�e (simple puff pastry) in Mastering the Art of French Cooking Vol. 2, page 113. But you can use any pasty crust recipe that you desire. 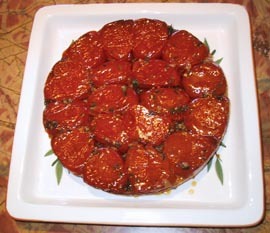 Arrange the cooked tomatoes (skin side down) in one layer in a 9-inch cake pan lightly coated with olive oil. (The pan should be about 2 inches deep.) The 18 halves will fit if you carefully wedge them in. Do not overlap them. After fitting in the tomatoes, lightly press them down with the back of a spoon or the palm of your hand to flatten them against the bottom of the pan. Sprinkle the basil-chard garnish oven the tomatoes. Roll out your pastry dough and cut it into a round, just a bit bigger than the size as your cake pan. Place the dough over the tomatoes and gently tuck the edges down the side of the pan. Bake according to the temperature of the pastry dough recipe you have chosen. Tomatoes don't need to cook further, so you're only baking the pastry dough at this point. Remove from the oven and let the tart cool in the baking pan for about 30 minutes. Then invert on a serving dish. Can be served warm or at room temperature. Cut into 6 - 8 wedges for serving.